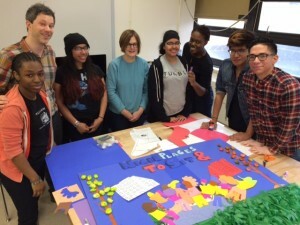 WHSAD students Nathifa Debellotte, Selena Davis, Ashly Cabrera, Ayana McKoy, David Lozada, and Ronny Tineo helping PB Committee members create their presentation boards. On Sunday, March 13 a group of our dedicated Y-PLAN students joined the Participatory Budgeting Committees in putting together their presentation board for the PB Project Expo on March 29th & 30th. The students provided the teams with renderings for five projects. They also helped create the presentations for the other projects that are up for voting. The students are excited to have a hand in helping to change the communities that they live and go to school in. See below to learn more about WHSAD’s Y-Plan project.